Soon I'll be back to painting flowers, landscapes and seascapes, but first one more pet portrait. This one will be a 5"x7" watercolor of two dogs that look very much alike at first glance. However, one is a lab/pit bull mix and the other a lab/border collie mix. I begin, as always, by deciding on the composition and then doing a detailed drawing. 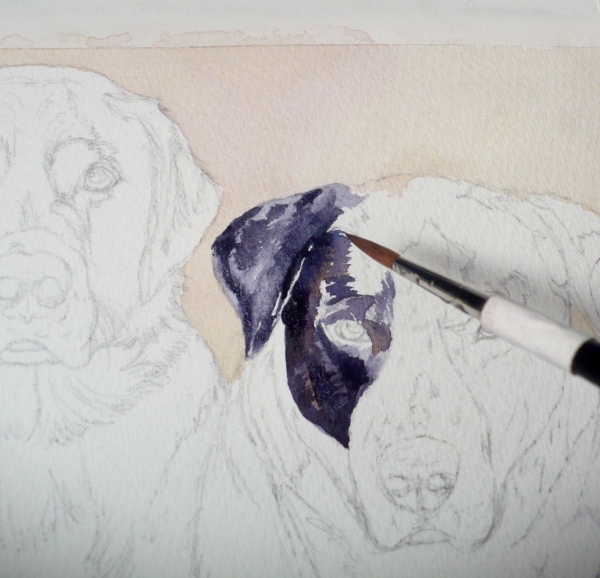 One of the things I enjoy about painting pet portraits is the stories that go with them. Every animal has his or her own unique history and personality. When clients fill in the Pet Portrait Questionnaire, they write about their pets. I use these stories and descriptions to help me decide the poses and composition of the piece. Rex, the lab/pit bull was rescued from a pound. He is "pretty mellow" and I've chosen a photo to use as reference that shows that part of his personality. 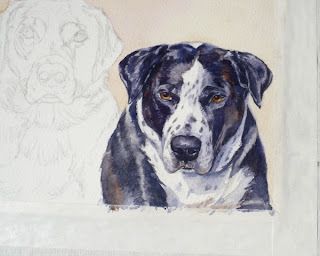 I'll begin the painting with Rex after washing in a soft, neutral background. Both Rex and Buster are black and white dogs. However, I never use black paint to denote the color black. I don't even own a tube of black paint! The reason is that flat black makes a dull, flat color. Who wants that? Also, a black coat on an animal is not totally black. You will see shades of brown or blue in it as well. So I mix my black from blue and brown paints. The blue and brown mixed equally make a gray when mixed with more water and a black when mixed with less water. Also, I can adjust the mixture to show either blue-black, brown-black, gray-black or deep black. All of these colors will appear in the dogs' coats. I love this phase of a portrait when the face begins to pop out from the paper as if it is coming alive. The effect is created by making the form rounded. Artists do this when they create a shadow side and a light side. I determined that the light will be coming from the left in this portrait. And of course, it will need to be the same for both dogs. 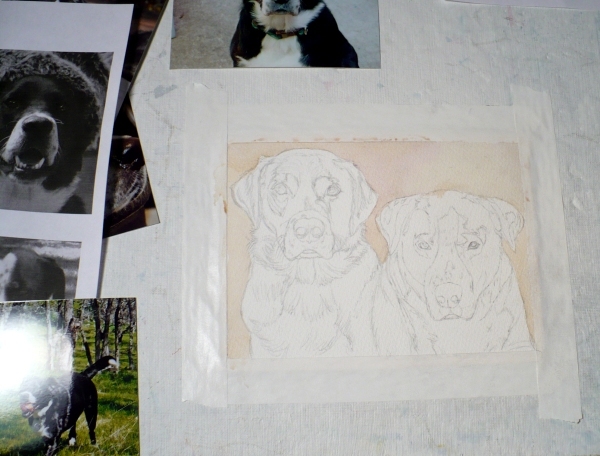 So the right side of each dog will be a bit darker as it's in shadow and the left side will be lighter. 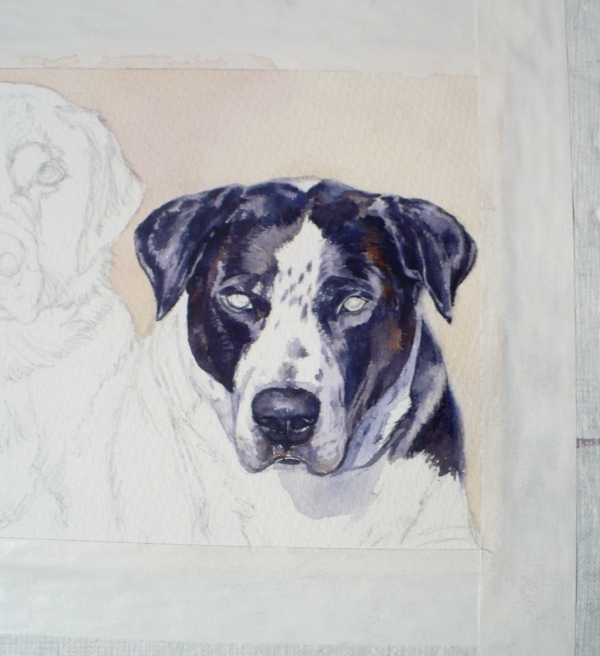 Rex's light brown eyes make his portrait come more alive. You can see this and any of the images larger by clicking on them. Rex may need some more adjustments, but that will wait for a bit. Tomorrow I will paint Buster and then adjust the shadows and light sides on both dogs until I'm satisfied with the results. Really well done...Rex is looking so brilliant, really realistic, your shadows and proportions are worked out really well. Looking forward to seeing Buster come alive. Thanks Ivana, I appreciate your comments!